Today’s nacho review takes us far, far away from the cold, Bud Light-drenched land of Boston to the warm, welcoming bosom of Western North Carolina. There, the beers are locally brewed (and cheap! ), the hippies run wild, and it’s still out-door dining weather. We found all three of these things in our recent trip to Asheville at the Asheville Brewing Company, a converted bus station turned brewpub/movie theater. The covered outdoor patio resembled a less dodgy and much better ventilated version of Our House West, with a rack of board games (including a giant custom-made Jenga set) and a corn hole game. Were the nachos too a step up? Here, we were confronted with two options: one nacho plate with corn tortilla chips (Nacho Mama), and one with flour (Nacho Daddy). We went with the flour chip offering with chicken, in hopes it would be the most original. Appearance: (7) Did we order pizza? 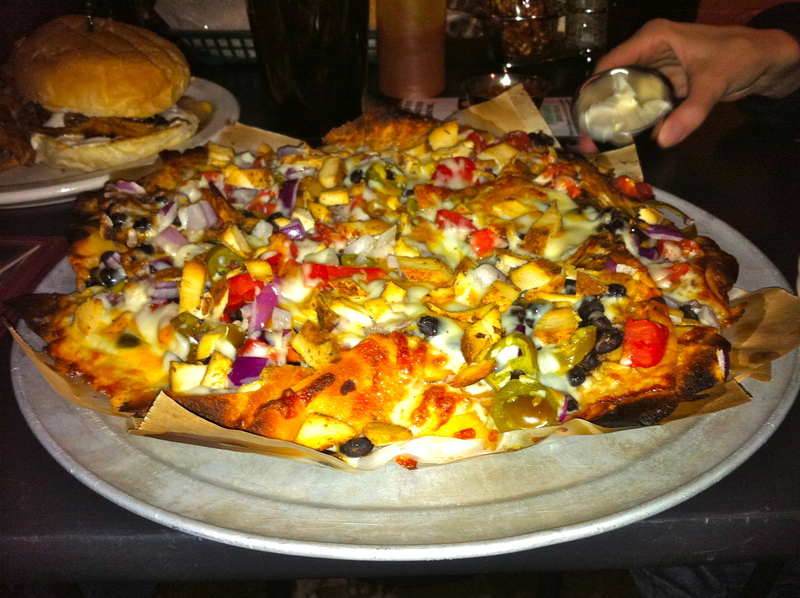 These nachos blew Uno’s out of the water in the “Flattest Nacho” competition; and the finely-chopped toppings did nothing to dispel their pizza-like image. Quality of Ingredients: (6) The chips were bizarre, like nothing we’d ever tasted on nachos but at the same time familiar. It took a few bites but we narrowed it down– they tasted exactly like the wrappers on crab rangoon. Interesting, but a bit too heavy after a few bites. The chicken was in tiny pieces and rather dry; black beans and some veggies were a nice touch. The salsa was pretty tasty, too bad it was on the side in a tiny container! Distribution of Toppings: (7) It’s hard to mess up distribution when your nachos are at max two chips deep. However, these still could have used a little more viscous ingredients. Price: (7) At $7.50, great for Boston, just OK for the boondocks. Overall: 28/40. While tasty, these nachos suffered a bit of an identity crisis. Pizza? Chinese food? 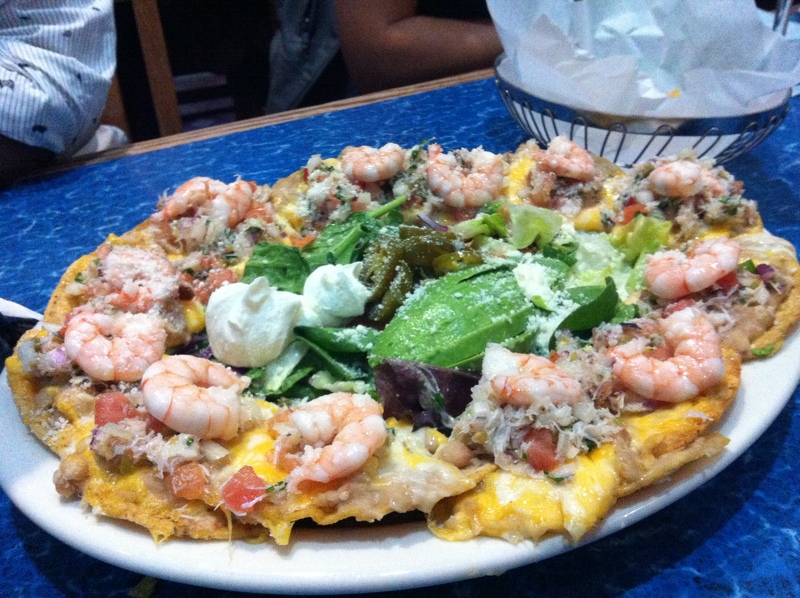 Or ‘chos? Until they make up their mind, unless you are really jonesing for some nachos you are better off looking elsewhere on the menu.